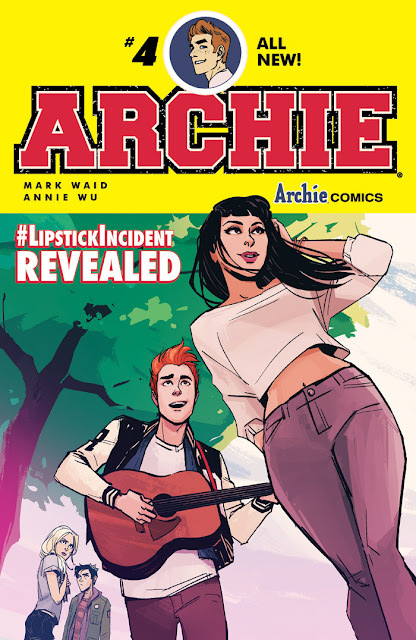 Once you've created a nearly flawless beginning to the new 'Archie' title, anything slightly less than what's come before in the first three issues will seem a lot worse than it is. Such is the case with issue #4 where Mark Waid reveals the genesis of the break-up between Archie and Betty in the "Lipstick Incident." The break-up has been the running theme in this reboot and while we get some answers something doesn't feel right. What does feel right is Annie Wu's art. Taking over for the wonderful Fiona Staples is no easy task but Wu is more than up for it. The issue starts well enough with a really sweet depiction of happier times between Archie and Betty. Their chemistry is effortless and joyous. They seem perfectly happy but you know it's all a set-up to get to their break-up. And once you arrive to the clumsily orchestrated, mean-spirited, convoluted circumstances that drove them apart you feel cheated of any real emotion. You're left to wonder incredulously "That's the reason they broke up?!" Waid disappoints by using cliches best left in 80's teenage romcoms or Disney Channel movies of the aughts. 'Archie' may be a fun and silly series but Archie and Betty deserved a little better execution in this trumpeted "Lipstick Incident." The saving grace for this issue is the outstanding art team of Wu, Jen Vaughn and Andre Szymanowicz. Wu uses her own style, more angular lines and frenetic movement than Staples, giving the scenes energy while maintaining the signature youthful look of Archie and the gang. Vaughn and Szymanowicz paint a bright and colorful atmosphere to represent the good times in the beginning of the issue and slowly over time, like a wilting flower or impending rain storm, the colors begin to darken ominously. It's inevitable that not each issue is going to be a homerun. Waid hit it big during the first three issues and stumbles with a lazy dribbler down the line with issue four. Wu seamlessly takes over the pencils with plenty of energy and style even lifting Waid's clumsy script along the way at times. We may know what drove Archie and Betty apart, but it wasn't the big deal we were led to believe.